IBM supercomputer Watson blew away the competition Tuesday night during its Jeopardy showdown with the game show's former champions Ken Jennings and Brad Rutter. The computer was able to answer 13 of the first 15 Jeopardy clues virtually uncontested, with one answer going to Jennings and another problem that all three contestants got wrong. Watson ended the broadcast with $35,734, followed by Rutter at $10,400 and Jennings at $4,800. The competitors will square off again Wednesday night for a final Jeopardy battle. There appeared to be some hope that Rutter and Jennings would be able to compete effectively against Watson during the latter part of Monday's Jeopardy round. Watson started to trip up on more advanced wordplay and ended Monday tied with Rutter at $5,000 each. But Watson and its 13.64 terabytes of memory got the job done quickly during Tuesday's broadcast, and in cutthroat fashion, too. Unlike Monday's show, Watson played aggressively, choosing large-money problems mostly in the Double Jeopardy round. The higher the clue's value, the harder the wordplay tends to be. The first 15 clues were indicative of how the rest of the game, went with Watson dominating the rest of the game. Watson surprised the audience during the second Daily Double clue when the computer wasn't sure of the answer but hazarded a guess anyway. Watson isn't supposed to answer unless its level of certainty passes a threshold (based on a percentage) dubbed Watson's "buzz threshold." The threshold isn't a fixed value and floats depending on the clue's level of difficulty. Watson was 32 percent certain of the correct answer, but that was well below its buzz threshold for that clue. So faced with the prospect of losing money if it didn't answer (only the contestant who picks the Daily Double clue may answer), the computer went with its best guess and it was correct. The Jeopardy clue Watson guessed on was, "The ‘Ancient Lion of Nimrud' went missing from this city's national museum in 2003 (along with a lot of other stuff)." The answer was "What is Baghdad?" Watson tripped up again in Final Jeopardy on which the computer wagered just $947. All three contestants were asked to identify a city with two airports: one named after a World War II hero and another named after a World War II battle. The correct answer was Chicago and both human contestants answered correctly. 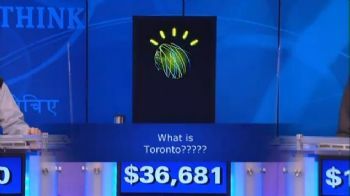 Watson, on the other hand, answered "Toronto" and was highly uncertain of its response. It appears the computer somehow failed to realize that the category, U.S. cities, would help narrow down its choices. You can check out IBM's take on what went wrong on the company's A Smarter Planet blog. Regardless of Watson's shortcomings the IBM super computer has been dominant against its human adversaries. Now, it all comes down to Wednesday night's broadcast when Jennings and Rutter will attempt to battle back and overcome Watson's commanding lead.